As well as adapting domestic properties for disabled users a lot of what Regency Disability Solutions do is large scale commercial adaptations and renovations for schools and colleges nationwide. 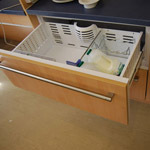 Regency are the nations leading food technology room/dept adaptation specialists. We have worked with various schools and colleges some of which are adapted to allow students with various degrees of disability to work and study in the same area as able bodied students at the same time. As schools and colleges have specific time slots when this kind of adaptation/ renovation can be carried out we suggest that you should make your enquiry sooner rather than later. If we can get the process started earlier then the team at RDS can work to your schedule making sure your project is complete and of the highest standard.